Set in Chimney Rock, North Carolina, the Esmeralda Inn & Restaurant is a rustic log cabin inn that offers an authentic mountain experience. Made from massive locust wood columns, old hardwood floors, and rhododendron railings, the intimate retreat rests on a forested hillside in the Western North Carolina Mountains and boasts beautiful views of the Rocky Broad River and surrounding Hickory Nut Gorge. 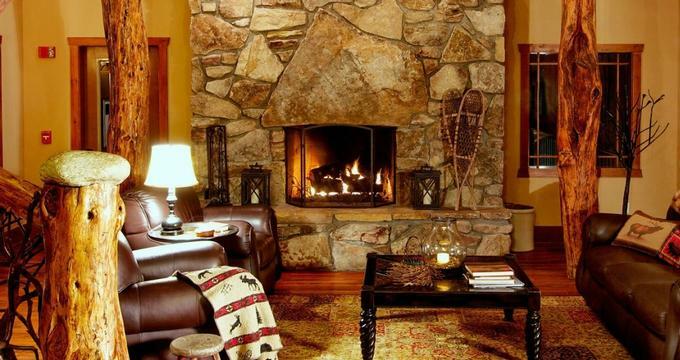 The Inn features comfortable accommodations, including three private cabins for larger groups and families, along with an array of amenities and facilities such as fireplaces and hot tubs to create an idyllic mountain retreat. The Esmeralda Inn & Restaurant also offers a family-friendly restaurant that serves dinner and hosts private events and has been used in various Hollywood productions such as The Last of the Mohicans, Firestarter and Dirty Dancing. The Esmeralda Inn & Restaurant features 14 stylishly appointed guest rooms and suites with rustic décor and furnishings, private bathrooms, and modern amenities, including comfortable pillow-top mattresses and luxury Anichini linens, 32-inch flat panel LCD TVs, Bose Wave music systems, and free wireless Internet. The Inn offers several room types ranging from Traditional and Mountain View Rooms to Terrace rooms, as well as a private cabin for families and larger groups of travelers. Traditional Rooms are 235 square feet in size and feature one king or two queen-size beds with pillow-top mattresses and luxury Anichini linens, private en-suite bathrooms with showers, environmentally-friendly spa toiletries, and luxury bathrobes, and modern amenities such as 32-inch flat panel LCD TVs, Bose Wave music systems, and free wireless Internet. These deluxe rooms look out over the garden and outdoor Jacuzzi area. Mountain View Queen Rooms are 188 square feet in size and feature breathtaking views Chimney Rock, the Rocky Broad River, and the Hickory Nut Gorge. These cozy rooms have queen-size beds with pillow-top mattresses and luxury Anichini linens, and private en-suite bathrooms with showers, environmentally-friendly spa toiletries, and luxury bathrobes. Modern amenities include 32-inch flat panel LCD TVs, Bose Wave music systems, and free wireless Internet. Premium Rooms are slightly larger than the Mountain View Rooms and feature open plan living spaces with one king or two queen-size beds with pillow-top mattresses and luxury Anichini linens, and private en-suite bathrooms with showers, environmentally-friendly spa toiletries, and luxury bathrobes. Modern amenities include 32-inch flat panel LCD TVs, Bose Wave music systems, electronically controlled ceiling fans, and free wireless Internet. Terrace King Rooms are the largest, most luxurious rooms at the Inn with direct access to the second-floor terrace and breathtaking views of the Rocky Broad River. The rooms have 270 square feet of space and have king-size beds with pillow-top mattresses and luxury Anichini linens, and private en-suite bathrooms with showers, environmentally-friendly spa toiletries, and luxury bathrobes. Terrace King Rooms have seasonal outdoor stone Jacuzzis and modern amenities, including 32-inch flat panel LCD TVs, Bose Wave music systems, electronically controlled ceiling fans, and free wireless Internet. The Esmeralda Cabin is located just next to the main inn and offers extra levels of privacy and peace. The cabin features three bedrooms and two bathrooms and large open plan living spaces with a wood-burning fireplace and television, and a fully equipped kitchen. The bedrooms feature king and queen size beds with pillow-top mattresses and luxury Anichini linens, and en-suite bathrooms have walk-in showers, environmentally-friendly spa toiletries, and luxury bathrobes. The cabin has a full porch with a swing, rockers and beautiful views of Chimney Rock. The Esmeralda Inn Chimney Rock Restaurant is a casual, family-friendly restaurant that serves seasonal menus of delicious local cuisine and beverages. Ideal for large gatherings or intimate dinners for two, the restaurant uses locally sourced ingredients and products to produce delectable and expertly crafted dishes, with daily blackboard specials available. The restaurant also features a Chef’s Table in a private dining room where guests can watch their meal being prepared by the expert chef, as well as enjoy cooking classes that are offered throughout the year. The Esmeralda Inn & Restaurant offers an array of amenities, facilities and guest services to enhance every stay, ranging from a complimentary hot breakfast served daily, complimentary gourmet coffee and tea throughout the day, and lunch and dinner served at the Esmeralda Inn Chimney Rock Restaurant with outdoor dining. An 1800 square foot outdoor patio has a fireplace and 18-person, in-ground Jacuzzi tub, swings and rockers for relaxing and soaking up the beautiful views, and there is a scenic park next to the Rocky Broad River with sitting areas, picnic tables, and hammocks where guests can relax. Business services include complimentary high-speed wireless internet access throughout the property, free local telephone calls. The Esmeralda Inn & Restaurant is a serene location for destination wedding receptions and rehearsal dinners. The Inn boasts two large dining areas, as well as a lounge and welcoming restaurant space, a professional gourmet kitchen, and beautiful front porches and outdoor deck with spectacular views of Chimney Rock Mountain. The Esmeralda Inn & Restaurant can accommodate parties of up to 80 guests for a standing cocktail party-style reception and offer a variety of wedding, reception and rehearsal dinner packages to suit every budget and taste.